I’ll have a Venti Propaganda. I had the chance to visit the Florida Keys recently, and you can guess what I was up to – hitting the beach to avoid AM interference from local electronics, so I could listen to Cuban radio stations! I did a dial scan for both AM and FM sides, each with its own issues. The math for daytime AM is pretty straightforward, it’s all groundwave so you can model power divided by distance squared. A rich vein of data is the FCC AM Query page. I pulled every AM signal within 450km of Key West and start whittling down against my notes. The main difficulty in going up against the FCC records is that… the FCC records are notoriously bad for international listings. They get Canada wrong on a regular basis (at least two times in recent memory, they completely dropped the ball watching out for Industry Canada assignments that impacted NPR signals in North Dakota), and Cuba is another story entirely. 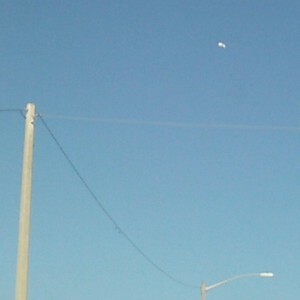 I’m pretty sure Cuba gives about zero flips for frequency coordinating with the US when we’ve still got blimp blasters in the Keys. Some other radio fans managed to snag some data off of EcuRed and turn it into a semi-manageable transmitter site list, which I can also crossreference after updating the list with some distance data. Another handicap is that I don’t speak Spanish, so I couldn’t glean much about those programs (though advertising seems exclusively American). The easy part is I don’t have to worry about skywave from Mexico or the Dominican Republic, or wherever. Since I couldn’t wait around to confirm callsigns, I’ll be poking around trying to confirm certain US stations in my model had Spanish programming around 1pm on the 25th. Once I have accounted for all the Florida-based Spanish-language stations, the remainder must be Cuban! My radio rig is a 1994-era car stereo that’s in my Geo Metro, I’m not hauling any fancy Grundig or what have you. One thing about this radio is that, especially on AM, it tends to bleed on either side of a strong signal, so when I was taking my notes I ignored a lot of nearby stations that sounded the same. Yet, if what I’m reading now about the Cuban radio networks is right, there might have been more separate stations than I thought. The FM scan is more problematic. Applying the same method as the AM scan, oddly, is not as sound of a model. VHF signals are much more line-of-sight than AM, true, but at longer distances, especially over warm water, they are also subject to anomalous propagation through the atmosphere. Tropospheric Propagation has a big fanbase in the ham radio community, it’s the main way uber-nerds snag a TV signal from 300 miles away. According to the Tropo reports for noon on the 25th, there may have been a weak opening between the Keys and Cuba, and perhaps a hint more in the direction of Miami and the Bahamas. 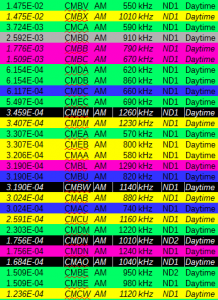 Trying to sort out all the stations that might contribute to the FM dial readout will be tough, I’ll look at it more down the road. Still, I’m pretty happy to have confirmed I caught at least two or three of the main Cuban radio networks. I think I’ve gotten over most of the growing pains with the new set. The Coolpad Rogue ships with two ways to get online, WiFi hotspot or USB tethering. WiFi is working fine, at least in an isolated spot, but I hate crowding the 2.4GHz spectrum with a high-power signal. USB tethering also pushes bits just fine, but I basically need to do an electronics project to keep it from draining my laptop and overfilling my handset battery. What I really miss is Bluetooth tethering, maybe there’s an app for that. As far as the throttling goes, I changed a few settings and found a better spot for coverage, apparently I was stuck on a 2G data channel when I started out. 24 kbps is actually pleasing news in that context. Right now, I’m doing much better on 4G. ABC doesn’t get a lot of major events anymore, but the Oscars rate among the handful of key live events still held by the network. In this neck of the woods, you’d have to get ABC affiliate WDAZ on cable, or attempt to nab it over-the-air. Despite the fact that Grand Forks is the home city for DAZ, because its city of licence is still technically “Devils Lake”, its tower is way west of town. The result is a weak signal that requires $70+ in antenna equipment and a clear view of the western horizon. Or in my case, $40 in antenna equipment and 20 minutes of setup before viewing. If only there was a way to get decent in-town reception of WDAZ. A DTS node at the top of WDAZ’s microwave tower would do the job nicely. While WDAZ’s minimal effort in investing in OTA viewers is disappointing, it is also unlikely that they will reap any dividends in the 2016 spectrum auction. VHF spectrum like DAZ’s channel 8 is not all that desirable any more, as mobile devices and TV alike clamour for medium-UHF frequencies that strike a balance between small antenna size and good building penetration. The big winner in North Dakota from the spectrum auction is likely to be the station flipper who currently owns KRDK (ex-KXJB, channel 38), which seems highly likely to shut down its minor tragedy of blank air and reruns with a big sack of cash from Verizon or Sprint. Depending on how much of the UHF band goes up for grabs, much the same may go for KNDB and KNDM — if they can get back on the air in time for the money to fly, that is. KCPM in Grand Forks is off the air again, BTW — after dabbling with a test pattern on 27.2. North Dakota Television has caught Greyscale, as it were, so here’s a fantasy coverage map moving the towers and transmitters of KXJB to Pembina, KXND to Bottineau, and KNDX to Killdeer. Stations placed in these locations would reach Manitoba and Oil Country. With thanks, as always, to Industry Canada. Hints of life at KCPM-DT (MNTV, Grand Forks, ND) this week as the signal returned to air following a long absence. KCPM also filed an FCC Form 317 earlier this month, though its licence renewal is nowhere to be seen ahead of its April 1 expiration. Today, an over-the-air antenna scan in Grand Forks will reveal 6 new streams on Channel 27 — with virtual channels 2-1 through 2-6 (making for an interesting dial conflict, as KGFE also has a channel 2-3). 2-1 carries KCPM programming and the rest are dead air. None of the channels appear to provide the Station ID data, and I’ve yet to see an hourly station ID card. It seems like a lot of effort to go through for less than two weeks of business. This is my guess: the station transmitter is being set up to do a digital flash-cut for 3ABN translator K17HG, which has been using six program streams on most of their transmitters. If the Channel 2 association is meant to be permanent, however, there may be a bigger station swap afoot in Grand Forks. According to reports, the frequencies AT&T bought in the former TV broadcast band are going to be reused… for TV. Expensive, private, pay TV. So what exactly did the DTV transition achieve, besides bankrupting nonprofit broadcasters? I present you with this exhaustively researched map of Minnesota counties by public television affiliate. This was partially based on channel listings from system operator websites and partially from channel listings reported to other sites for program guide purposes. It is current and accurate to the best of my present ability as of late July 2013. Networks are identified solely by the flagship station. Counties where there is substantial overlap between two particular networks are indicated. The map only accounts for MPTA members, and does not include adjacent public television networks TVO (north), TFO (north), SDPB (southwest), IPTV (south), or WPT (east). It’s also debatable if CBC (north) counts as public television these days. It’s storm season again! Time to redo the survey of Weather radars located within or covering part of North Dakota. NEXRAD sites are fairly well the gold standard. Recently all of the sites were upgraded to Dual Polarimetry, which is a significant technological leap. As you can see in the map, there are obvious gaps in our neighbourhood, so it’s fortunate there are additional weather radars around! Environment Canada Weather Radar is largely comparable to older NWS Doppler Radars. There’s a modernization campaign to add Dual Polarization, which hasn’t swept west. My underinformed guess is that the ARB uses surplused 74C units. Nominally it’s to support “weather modification” flights in western North Dakota, but it does have the side effect of providing low-level coverage in some notable NEXRAD holes. Grand Forks Intermittent, often on during storms. Legend says that during the long death of the Williston office of the National Weather Service, NWS Bismarck kludged together a way to get weather radar out of the air traffic radar in Watford City so they could finally shut off the Williston 74C. The Watford City site is an ARSR-4 L-Band radar, a lower frequency than NEXRAD (S-Band) or EC (C-Band) weather radar. You can easily see the returns from passing aircraft in the readout, and the angular resolution is grainy at best, but considering that it was tacked on as an afterthought the product is truly remarkable. Selective TV of Alexandria, Minnesota is quite fascinating. Alexandria, just beyond the fringe of both the Fargo and Minneapolis stations, still has oodles of watchable television thanks to a dedicated group. I picked up this channel list when I passed by the town today. RabbitEars has nice coverage maps for many of the Selective transmitters, but some of the calls there are out of date.